EDC Las Vegas is Insomniac’s biggest party of the year, but the days leading up to it—as well as those following—have become calendar-worthy events unto themselves. Officially dubbed “EDC Week” by Las Vegas Mayor Carolyn Goodman in 2013, it’s seven days of curated entertainment and special events, beginning the Wednesday before EDC and ending on Wednesday, May 23. World-class artists descend upon the city in honor of North America’s largest dance music event, treating fans to special sets at unprecedented indoor and outdoor venues. Last year, EDC Week brought over 100 talented tastemakers together for more than 60 parties at the best day and nightclubs throughout Las Vegas. 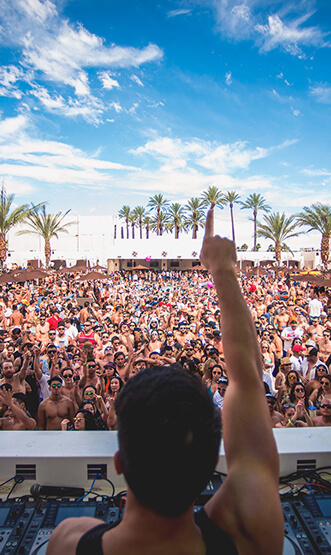 Acts included Calvin Harris at Hakkasan Nightclub, RÜFÜS DU SOL at Drai’s BeachClub, Kygo at XS Nightclub, Jamie Jones at DAYLIGHT Beach Club, and Galantis at Marquee Dayclub in the Cosmopolitan. Of course, wherever Insomniac goes, we make it a priority to give back. To show our dedication and commitment to the community that we call home for this entire week, in 2015 we launched the EDC Week Charity Auction, presented in partnership with eBay for Charity. In 2017, fans from around the world bid on more than 50 once-in-a-lifetime opportunities with EDC artists. The auction raised over $162,000 for Boys & Girls Clubs of Southern Nevada. Two decades since its inception, Electric Daisy Carnival is going strong, with the community around it even stronger. Here’s to even more great years as we continue to celebrate the institution of dance music and build the scene together. The 23rd edition of EDC Las Vegas returns to Las Vegas Motor Speedway May 18–20, 2018, featuring early-entry opening ceremonies, new stage designs, cooler weather, and a new third-party shuttle provider. Tickets can be purchased at edclasvegas.com.